Being 30,000 feet in the air in an airplane is far from the most hydrating experience, so it’s not surprising that you might find yourself extra parched when you’re on a flight. When flight attendants come around with drink offers, you’re probably going to opt for one of your favorites… but if that’s Diet Coke, you might want to order something else. Flight attendants actually hate it when you order Diet Coke on an airplane. As weird as that sounds, the reasoning behind it actually does make sense. Apparently, out of all of the bubbly soft drinks you could ask for when you’re up in the air, Diet Coke is the most obnoxious to pour. And your flight attendant is likely going to hold back an eye roll if you order one or more. Why is this type of soda worse than any other? 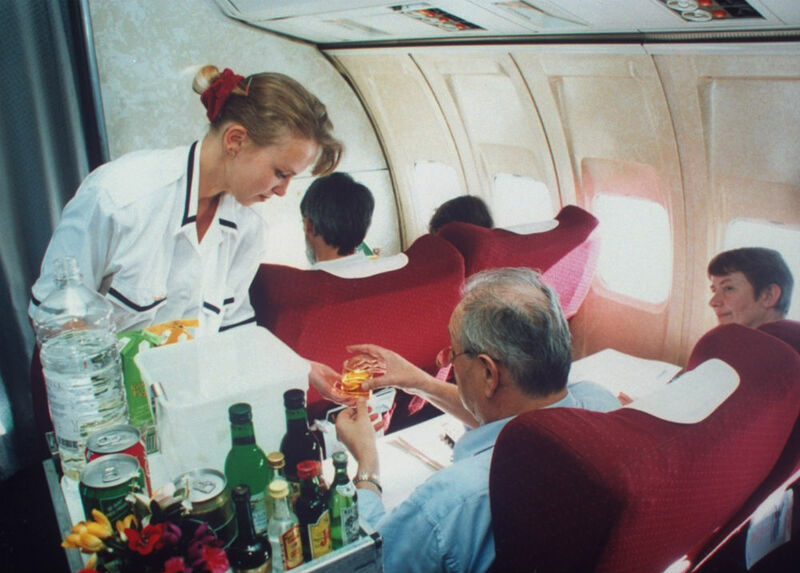 According to a post on the flight attendant blog These Gold Wings, Diet Coke foams up more than non-diet drinks, slowing down flight attendants and creating a bit of a backup in drink service. "Of all the drinks we serve, Diet Coke takes the most time to pour — the fizz takes forever to settle at 35,000 feet. In the time it takes me to pour a single cup of Diet Coke, I can serve three passengers a different beverage. So even though giving cans to first-class passengers is a big no-no, you'll occasionally spy 12 ounces of silver trimmed in red sitting up there." This issue is so huge for flight attendants HuffPost actually reached out to Coca-Cola to get an official statement, but a Coke spokesperson wouldn’t confirm that Diet Coke does this in the air. Basically, if you want a drink ASAP on your next flight, you might want to stay away from the diet options!